The Galt Playnest and Gym Farm is suitable from birth. 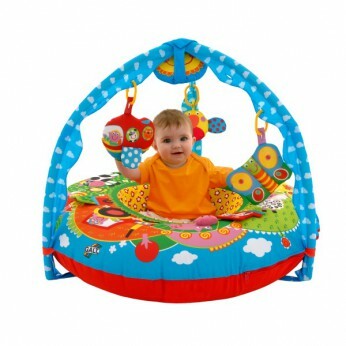 A soft supporting multi-sensory environment for baby, with the original circular covered inflatable. Playnest features a fun farm scene with the gym as the sky above. Five different toys on each side to give varied patterns and colours to provide vital stimulation. Toys can be rearranged on the colourful links at different heights according to the babys ability to focus on them. This toy costs approximately £49.99 (for the latest and best prices make sure you check our retailer list for the Galt Playnest and Gym Farm above). In our review of Galt Playnest and Gym Farm we classed it as being suitable for ages 0 to 11 months but recommend you check the manufacturer specific advice before purchasing.